It’s a wrap on 2014, but where to now for the tour? More spectator barricades, more parking and more food options in the village, these are a few of the ideas flowing through to our desk post tour. Already we have also had several teams approaching us looking to secure invites for 2015. We need to look at our invites in context of our desire to incorporate at least a few teams from the Eastern States and a few from overseas. We are also conscious of the fact that securing a place sooner rather than later is relevant to the planning and sponsor procurement of our participating teams. It’s a nice problem to have with more teams wanting to race than we can cater for, but never the less it is a real problem and one that we will be looking into over the next few weeks. Two things that we can say for sure about 2015; The Pro-Am format will be back and we will be pushing out into the hillier areas of the greater Blackwood Valley. Feel free to send us your feedback and feel free to send us details of potential stages that you would like to see included in future tours. Grit your teeth and silence your legs…Jensie is coming to the Tour! Beardy’s Caravan is coming to TOMR! Having been involved in every TOMR I must say there is just so much going right that it’s hard to find much to improve but after going through it all with the team we have possibly three ideas. Firstly, it’d be great to see a seperate set of awards for each group (and announced) thus, top three sprinters, leaders, jr (if there are multiple jr in that cat) and team. They need not all be presented at each stage – nor have new jerseys each stage (although it’d be nice) metarace could sort that – perhaps just a reusable arm band or something? Secondly, it would be cool if there was a crit/kermese/points race (not all) to even the field with the hilly stages – if time/space was an issue perhaps run both together and teams can spread their riders across one of either event eg 4 in hilly stage whilst 2 do a crit instead? Similar to the second TOMR where 3 did one race & three did the other. Finally, because money is an issue for some teams and not others perhaps a combo of early bird deals (I’d pay today for 2015 if I had the cash), and a fundraising or charity fund raising discount? Given the early lead in some keen but cash strapped teams may be able to help raise cash and/or promote the event in other ways to stop the costs being prohibitive in 2015. Good feedback. A Crit for 2015 is likely. This year we observed a number of teams getting new kit specifically for the tour and tour specific sponsors, this helped some teams pay for a part of their campaign, others we know made a profit on their ToMR campaigns. Also – regarding memorabilia for sale – given you have 600 guys and girls tat have been given a leave pass for the weekend and most of them have children or grandchildren – how about say miniature cows, or other sorts of things that can be given as gifts. Yes – and someone selling drinks at the stage 5 finish! Agreed, we definitely need more merchandise and everyone should have the opportunity to take home a cow of some description. Like the idea of some more hilly stages and possibly push distances up by 20km/stage. Thanks Carl, We would have had leaders jerseys for each group in 2014 if not for a technical hitch in the delivery. At Rosa Brook, the womens field had hardly any time to get their breath back, let alone check out refreshments offered by the locals before being asked to start stage 4. Many of us therefore suffered with not enough food/ water during the 40km back to the start village. Mandurah closes off roads for the day for these events. Home owners and or shop keepers cannot get in or out during this time but cyclists safety is paramount. Closing of a few streets centrally is quite different to shutting down kilometres of road and isolating businesses for hours on end. The perception that closing off roads makes road cycling events safer is not necessarily founded in statistics. The most dangerous road cycling events in Western Australia arguably happen on closed roads. To close large sectors of road also requires significant support from police, something that we do not currently have as a non government event. Some closed circuit racing as part of the tour is a realistic possibility in the short term. I didn’t go to it this year, I’d be interested in racing next year. But are you keeping the format the same for the women’s race? Do you have a set number of places allocated to women or is it simply those who put a team together and was there a capacity for more women. To encourage more women to race I would like to see a change to the team format especially in the women’s race. Ideally if we can get enough women to ride we can split this group into two. The premier event on the WA calendar. Absolutely fantastic 95/100! a few small suggestions to consider. After 3 days of riding, and doing the Fly 6 60km, the 40km return was really tough for us lower grade riders. Big bunches of tired riders and a few hills resulted in some crashes. I’m not sure how to reconcile my next thought, circuit riding for spectators is a must. great atmosphere. 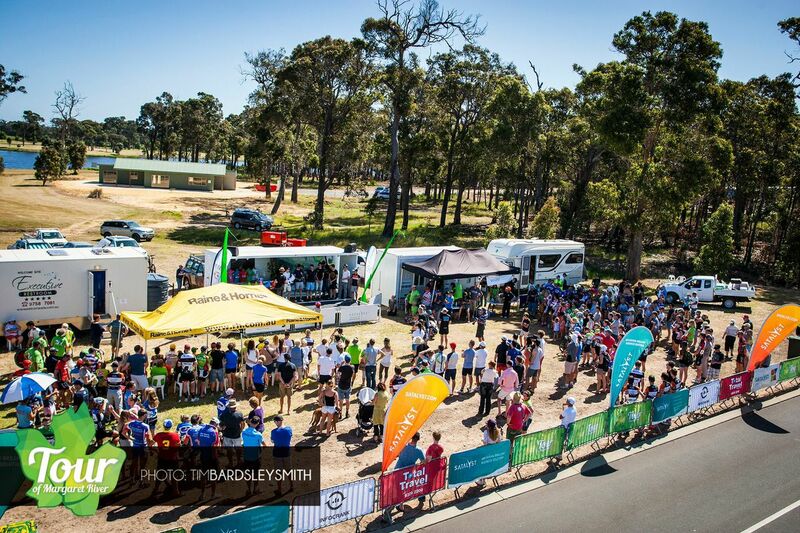 in 2013, although the event was more confined to Cowaramup and surrounds, it had the spectator vibe. 2014 had more variety, but slightly less engagement of spectators. I’m not sure where the correct balance is. Now, how do you make it part of the NRS?? © 2019 Tour of Margaret River.